Soaked in sentiment, The Odd Life of Timothy Green requires a leap of faith the movie never enabled me to make. A Disney-produced fantasy, Odd Life tells a story in which a couple that’s been unable to procreate decides to rip pages from a small pad and write down their wishes for an ideal child. Perhaps to put the matter permanently to rest, they bury the papers in a box in their backyard garden. A violent storm hits, and magic ensues: A dirt-covered boy with leaves sprouting from his legs appears. He’s Timothy, and he grew in the garden. 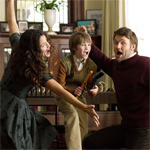 The couple (Jennifer Garner and Joel Edgerton) are flabbergasted by this child of the soil, but gradually adjust to the presence of their “son” (CJ Adams). As Timothy tries to fit into his new family and community, he’s enrolled in school, plays soccer (badly), cheers up his dying grandfather (M. Emmet Walsh) and fulfills his parents dreams. Everything’s going fine until Timothy’s leaves begin to yellow and fall. (No, I’m not making this up.) There’s also a subplot about how dad, who works at the town’s pencil factory, must fight to keep the factory open. Mom has a job, too. She gives tours at the local pencil museum. Interesting actors are wasted in support. Rosemarie DeWitt plays Garner’s stuffy sister, and David Morse portrays Timothy’s other grandfather. Dianne Wiest signs on as a local sourpuss. I’m sure some folks who will buy this family-friendly fluff as sweet, sad and stirring. I’m not one of them. It struck me as a little creepy.